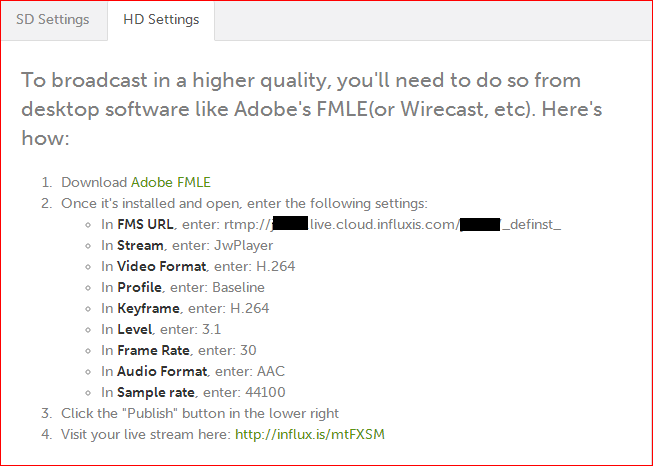 This is a quick guide on how to stream a live broadcast, using Influxis and your JW Player. 1. Once you are signed in to your Influxis account, click the “Live” button at the top of the dashboard. 3. Once the stream is created, you can enable “AutoRecord” if you would like the stream to be archived. You can click “Edit” to go back and make changes as well. 4. When the stream has been created, you can enter the “Broadcasting” page and copy the broadcasting information from the “HD Settings” tab. 5. When you have the publishing information, you can add it into your encoder. 6. 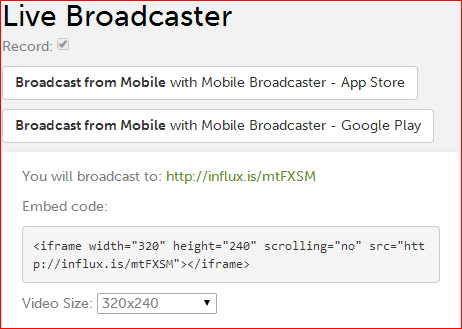 Once you have begun publishing a live stream, you can embed the JW Player using the embed code, or use the pre-generated URL (http://influx.is/XXXXX). 7. Now you are streaming live with JW Player.